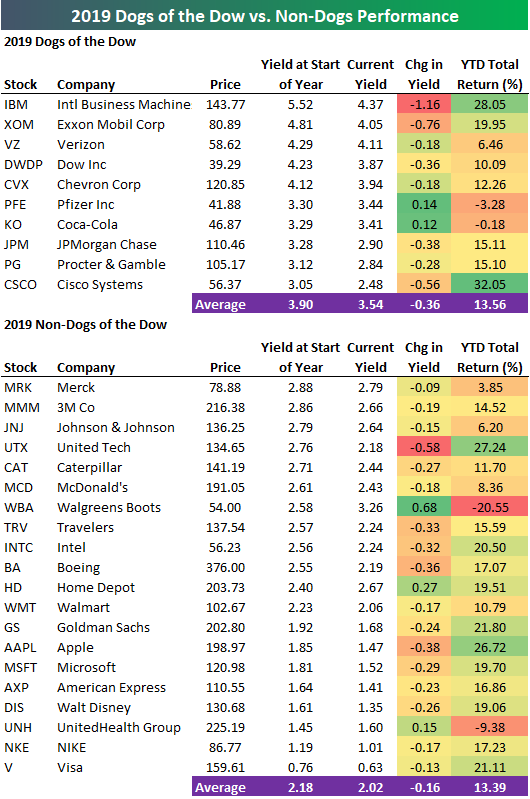 Two Tech stocks that are part of this year’s Dogs are up the most, with IBM up 28.05% and Cisco (CSCO) up 32.05%. IBM started the year yielding 5.52%, but its yield is now down to 4.37% after a significant share price gain. CSCO started the year with a yield of 3.05% that is down to 2.48% as of today. Of the 20 non-Dogs, United Tech (UTX) is up the most at +27.24%, while Apple (AAPL) is up the 2nd most at +26.72%. Walgreens Boots (WBA) — the most recently added Dow member — is down the most at -20.55%. UnitedHealth (UNH) is the only other non-Dog that’s in the red for the year with a decline of 9.38%.